Winning the 2014 Ballance Farm Environment Awards gives Canterbury dairy farmers Mark and Devon Slee the opportunity to tell some ‘good news’ stories about their industry and New Zealand agriculture in general. 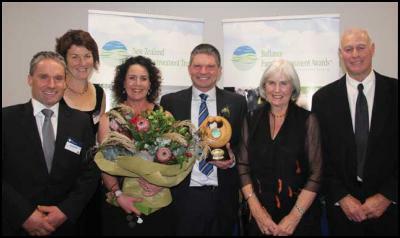 The Slees were presented with the Gordon Stephenson trophy at the New Zealand Farm Environment Trust’s National Sustainability Showcase in Christchurch on June 26. The couple was surprised and delighted to receive the award, accepting it on behalf of the entire dairy industry. Mark Slee says he and Devon are proud to be dairy farmers. . .
Four South Canterbury cropping farmers were so smitten with the precision of a soil sampling machine that they brought it back with them from the United States. The Veris MSP3 3150 was imported by Colin Hurst and Hugh Wigley, who farm at Makikihi, in Waimate, and Michael Tayler and Nick Ward, from Winchester. Commonly used in the big corn belts of the US since 2003, the technology is new to New Zealand, with only one other machine here. The $70,000 machine is towed behind a tractor, and uses electrical conductivity to map paddocks for soil texture, and infrared measurement to detect organic matter, while constantly sampling soils for their Ph levels. . .
Massey University and Plant & Food Research have formed a new joint graduate school to increase collaboration between the two institutes. About a dozen Massey masters and doctoral students are studying topics that would in future be offered at the school. This number is expected to increase with the availability of new research projects and supervisors from Plant & Food Research. . .
Dave Clouston knew his life would change the moment his pelvis jackknifed to his chest. The fit farmer, hardened from years of mustering, was at his working peak and had earlier run through the forest to grab a tractor before his next job of stacking hay in a barn. Clouston had worked his way up as a sheep and beef farmer on some of the best mustering blocks in Canterbury, and the young married man was managing a family business at Whitecliffs. “I was stacking some hay we had brought in, and there was some loose hay on the floor of the barn. I jumped off the tractor to clear that away, and while I was bending over to do that the hay unsettled enough to come down on top of me – I never dreamed it would do that – from five high. They were big, square bales, and at least a couple hit me, and I was left pinned under one of them with my pelvis under my chest.” . . THE discovery of some snowy strands in my dark brown ‘do this week brought me both pleasure and pain – the ‘pain’ of ageing of course stings, but the pleasure was based on the realisation that the older I grow, the more I’ll be taken seriously in Australian agribusiness. Most Australian business, including agribusiness, uses age-old management styles. It’s a vertical, top heavy system that that needs ‘workers’ not ‘contributors’. The sector has limited time for innovation and is resistant to change. We live in a fast-paced, globalised world and this structure is failing us. These old school management styles put a lot of power at the top of the hierarchy and from there it’s a top down management approach (autocratic). . .
Canada’s dairy cartel keeps milk product prices up. Baby formula is one pretty obvious example. Here in New Zealand, a 900 gram can of baby formula (starter, for newborns) ranges in price from $15 for one that’s on special, to $20-$21 for the most popular brands, to $34 for the ones that give babies superpowers. We supplemented with the brand that’s now $21 per can. The NZ price range then, per kilo and in Canadian dollars at $1 NZ = $0.79 Cdn, is $13-$30; the one we typically bought was $18 Cdn. Unfortunately, the link might redirect to Countdown’s main site. A screenshot is below. . . The Sutherland family, from Benmore Station, has been awarded the Otago Merino Association’s clip-of-the-year title. Bill and Kate Sutherland, and Andrew and Deidre Sutherland, from Omarama, received the award during The New Zealand Merino Company’s conference in Christchurch . . .
Changes are inevitable. Not only is that now the motto of luxury Italian woollen fabric manufacturer Reda, but it was also a statement that was repeated during the New Zealand Merino Company’s recent conference in Christchurch. The conference brought together about 600 growers and industry partners from around the globe. . . The property is farmed by Donny and Cathy Maclean, their daughter Kate, and Mr Maclean’s parents, Don and Win . . .
Waimate farmers are crying foul after being faced with a dramatic increase in rates for the 2012-2013 year. The proposed increases will see some farmers pay out nearly $5000 more in rates than they did last year, Federated Farmers South Canterbury Waimate branch chairman Colin Hurst said. “One farmer’s rates are increasing 37 per cent from just over $13,000 to around $18,000. . .
What prompts a 94-year-old dairy farm owner to build structures of biblical proportions to keep animals from the driving rain? Shawn McAvinue reports. Eastern Southland dairy farm owner Dugald McKenzie, 94, looks up at the frame of one of the two wintering barns he is having built on his dairy farm near Edendale and estimates the size of the structure. “It’s not quite as long as Noah’s Ark, but it’s slightly wider.”. .
After 10 weeks of worker protests, punctuated by fruitless talks and exchanges of lock-out and strike threats, the Affco-meatworkers dispute is no closer to resolution. The bitterness of the dispute – over pay and conditions for 1000 union workers at eight plants – comes as no surprise to anyone in the meat industry. The protagonists, the Talley family on one side and the Meatworkers Union on the other, are an irresistible force coming up against an immovable object – or, as one industry source puts it, “a rock hitting a rock”. . .
“Manawhenua” is one of the operating values of the Kapenga M Farming Trust. The exact English translation of “Manawhenua” is difficult to explain. However it relates to the pride and soul of Maori people & their attachment to traditional lands. Manawhenua is about creating links between the people & the land. The concept of ‘mana whenua’ has many layers of meaning. It tells of important relationships that Māori have with whenua (land) and of the value placed upon the land within the culture . . .
Sealord Group is selling its last few South Island mussel farms and closing its Tahunanui factory, bringing down the curtain on what was once the biggest mussel operation in the South Island. All 50 workers – 10 operating the farms and 40 at the Beatty St factory – are being offered new roles within Sealord. The company announced yesterday that it wanted to focus more on its core fishing business. . .
Synlait Milk, the Canterbury milk processor controlled by China’s Bright Dairy, has signed a deal to supply colostrum to ASX-listed biopharmaceutical company Immuron. No value was put on the agreement. Synlait spokesman Michael Wan said the company planned a production run of the “hyperimmune colostrum” in October. While volumes would be small compared to Synlait’s total production, it was high-end in terms of value. . . The Primary Industry Capability Alliance (PICA) was officially launched in Wellington last night. The initiative was warmly received by an audience of influential leaders in the primary industry. The Minister for Primary Industries, Hon. David Carter presented at the launch along with several other speakers. PICA is a collaboration between DairyNZ, Beef + Lamb New Zealand, New Zealand Young Farmers, AgITO, Lincoln and Massey Universities, Federated Farmers and the Ministry for Primary Industries. . .
Daniel Baker says this year’s North Island Farming to Succeed programme has shown him that farm ownership is possible for his generation. Daniel is currently a sole charge farm manager milking 280 cows near Te Awamutu for the Ferris family. He was motivated to apply for Farming to Succeed after hearing good things about the programme from previous attendees . . .